One of several rock legends of yesteryear that I’ve never got around to until now, one-time Procul Harum guitarist Robin Trower is still making music and touring as he reaches his seventies. Although he continues to release albums, his career is still defined by 1974’s ‘Bridge Of Sighs’ album, with several tracks off that record remaining staples of his live gigs. Often compared to Hendrix back in the 70s, he is still a draw as a healthy attendance at the main stage at Chester’s Live Rooms attests. I’d hoped to catch opener Stevie Nimmo Trio but delays getting into the city of Chester and then finding somewhere to park, meant that by the time I got into the hall all I heard from the big Scotsman was ‘Thank you – enjoy the rest of your evening, goodnight!’. I was soon able to greet Stevie (older brother of King King’s Alan Nimmo) at the merch table however and treat myself to a CD, which he told me formed the majority of the set I’d missed! Listening to that on the way home afterwards, it’s safe to say if you like his brother’s band (and if you are of discerning taste, you surely will!) then you’ll like Stevie Nimmo’s material also. A short while later, a guitar tech appeared brandishing a white Fender Stratocaster, soon followed by a slightly-built elderly gent who was handed the instrument, as he was followed by two obviously much younger guys. Yep, that was Robin Trower and his low-key entrance was soon ramped up once he plugged in. He might be an old fella now, but he can still cook up a mighty storm with the guitar. Opening number was ‘Too Rolling Stoned’; from that seminal ‘Bridge of Sighs’ album and a frequently-played track on Planet Rock radio station, it got the crowd going straight away. These days, the lead vocal is handled by bassist Richard Watt, he is not James Dewar (Trower’s bassist/vocalist during his heyday, sadly passed away in 2002) but still gave a decent vocal delivery – when he could be heard over the mighty sound coming from the older guy with thinning silver hair. Most of the vocals were handled by Watt; the main man did take lead vocal on a handful of numbers but his voice is in his fingers, not his throat. Several numbers spun out into extended showcases for his playing, the rhythm section of Watt and drummer Chris Taggart knew exactly when to step back and just let the maestro play. 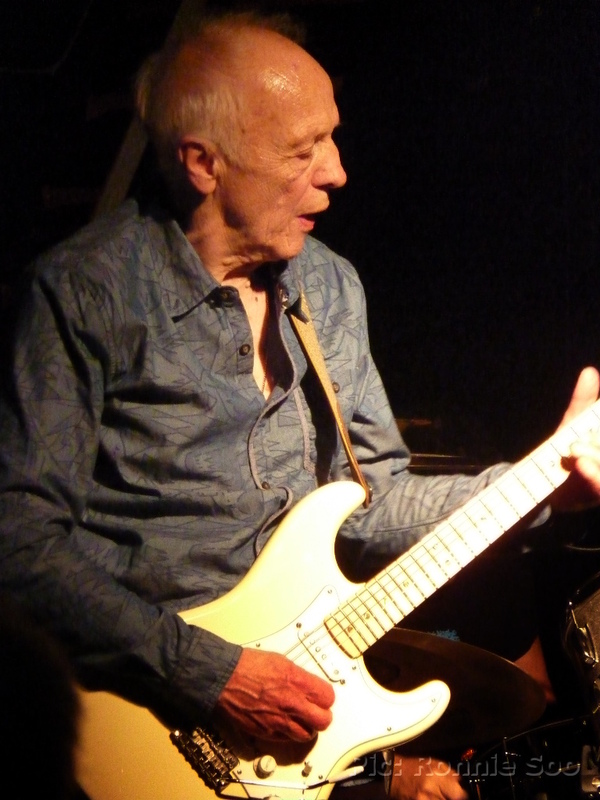 In return, Trower gave a masterclass in power and control, he has all the force of any heavy metal axe hero but knows when – and when not – to use it. In addition, his tone is something almost every other guitarist playing would sell their grandmother to have. He really makes that guitar sing, an art that is rapidly becoming lost in this day and age. The huge cheers after every number were greeted with a modest grin and a simple ‘we really appreciate that, thank you’. Despite his advancing years the guitar legend is showing no sign of losing the magic touch, he still has ‘it’. This must go down as another one of my ‘why did I leave it so long’ gigs, it really was a pleasure to watch such a master of his instrument in such intimate surroundings. When he comes around again, take the chance to see Robin Trower live.